The SMART Collaborative's iScholars celebrate their achievements at the North Carolina chapter of the Association for Learning Environments conference. 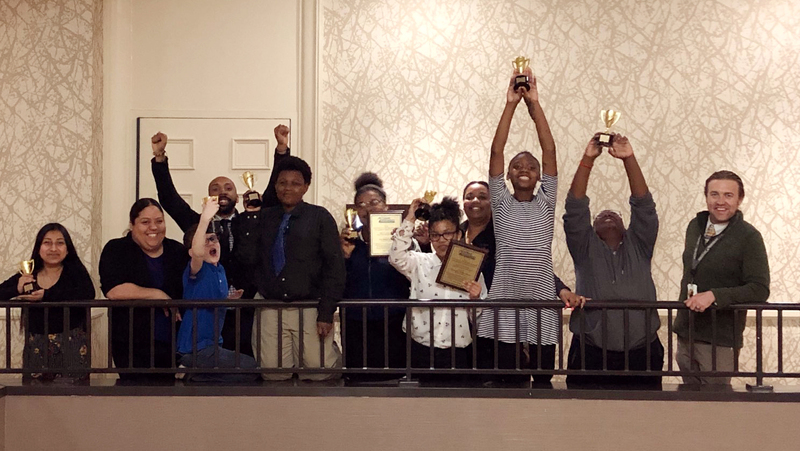 Led by advisors within the NC State College of Education’s SMART Collaborative, seven middle school students in Durham advanced during the SchoolsNEXT competition held as part of the North Carolina chapter of the Association for Learning Environments conference on March 31 – April 2, 2019. The students, from Carrington Middle School and Neal Middle School, are members of the iScholars program*, an afterschool initiative part of the SMART Collaborative and based out of the NC State Education for students to collaborate on meaningful STEM projects that speak to social and physical conditions they have identified in their own communities. In the SchoolsNEXT competition, students planned and designed sustainable and resilient learning spaces that encourage innovation, critical thinking and collaboration, then presented their designs alongside peers from other schools in North Carolina to architects, engineers, educational planners and other learning environment design stakeholders. The iScholars group created a school that honored students’ cultures and fostered a sense of belonging in all students. They drew inspiration from ethnic and indigenous patterns to design the architecture of their proposed building that doubled as a cultural center for the community. Ali said the group also drew inspiration from the movie Black Panther and incorporated elements from the Afro-futuristic city of Wakanda into their design. With a successful first showing of their design at the state level, the iScholars will advance to the regional competition with hopes of returning to the international-level competition in Los Angeles, California, for the second year in a row. About the SMART Collaborative: The SMART Collaborative is an interdisciplinary community of educators and researchers who are firmly committed to making schools places where all students want to be and want to learn. Dr. DeLeon Gray, an associate professor of educational psychology at the NC State College of Education and faculty fellow in NC State’s African American Cultural Center, leads the initiative alongside Dr. Lauren Bryant, a research scholar at the college. Currently, the SMART Collaborative supports the iScholars program that works to develop a coherent set of instructional practices for teachers and community stakeholders that target motivational needs specific to early adolescents in Durham, North Carolina, and the STEM Career Clubs Strategies project that establishes after-school STEM Career Clubs at isolated rural middle schools in northeastern North Carolina. *iScholars is supported by the National Science Foundation under award no. 1433747.